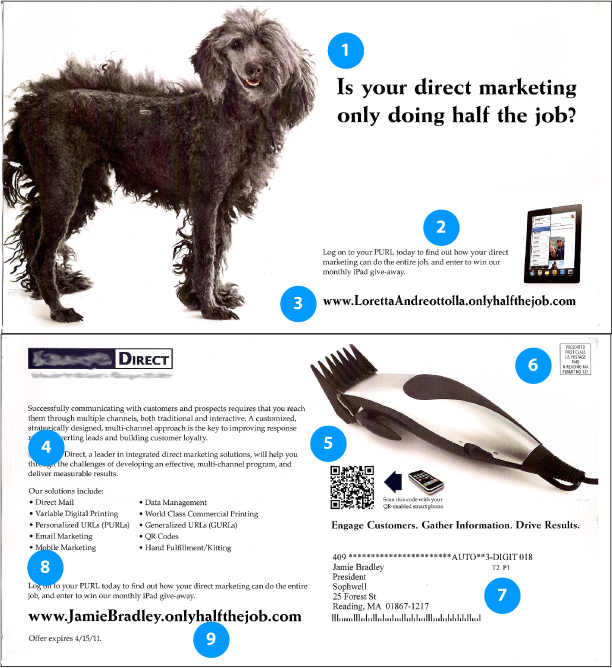 I am a big fan of direct mail, when it is done right. That’s often easier said than done. Here’s one I got from a company selling their direct mail/integrated marketing services, and they did everything pretty well except one thing. That one thing killed their credibility as a direct mail services provider. Let’s take a look (click on the image for a larger version). 1.) An unexpected image with a relevant tag line. Good for creating interest. Nice job. 2.) A clear call to action with a nice incentive (iPad giveaway!). Nice job. 3.) A PURL, or personalized URL, designed to integrate print media with an online experience. The URL “OnlyHalfTheJob.com” reinforces the theme. It all ties in with their message of creating cross-platform communications. Nice job. 4.) The text here is pretty generic, with no real compelling story to get people to act. It doesn’t answer the reader’s question, “What’s in it for me?” (other than Free iPad!) Meh. 5.) A QR Code provides a way for the reader to opt in via their smartphone – also a good tie-in with their message of cross platform communications. Nice job. 6.) A First Class Mail permit. If you are investing money in a cross platform mailing like this, you don’t want to skimp on standard mail postage when up to 10% of your mailing list might not ever receive your offer. Nice job. 7.) Uh, oh. This is my old office address. I moved from there five months ago, and this company has quoted projects for me since then. Someone hasn’t kept the data base up to date. Not good. 8.) A follow up reminder of the call to action, along with an expiration date to encourage action sooner. Nice job. 9.) Repeating the PURL to make sure I remember how to opt in. But wait, go back and look at #3 more closely. BIG FAIL!!!!! For a company to spent several thousand dollars on production, photography, data integration, URL purchases, website development and postage to tell the world how great they are at direct mail services, and then have them botch matching the name from one location to another is deadly to their message. I don’t mean to pick on this specific company, and I blurred out the name intentionally. They are the mailing division of a printer I like a lot. I met their sales manager in 1981. I once slept overnight on the couch in their customer lounge during an extended press OK, and then had a beer with the 3rd shift pressmen at 7 am after they quit work for the night. Great bunch of guys. The truth is, mistakes happen, even to really good companies. They probably weren’t as careful checking their own promotion as they would for their clients. Ironically, the “only doing half the job” theme describes what they did to themselves. But companies can’t afford to waste time and resources. I bet if they had an outside resource do this for them, this mistake never would have happened. Ouch.